Alcohol advertisers are literally preying on our children, on minorities, on the lesser-educated and the poor. And they are doing so right out in the open. Legally. As children go to school, as laborers go to work, as people go about their daily lives, they are besieged by messages to drink. People are all but forced to view alcohol ads as they on wait on subway platforms, ride in trains, and pass through stations. And alcohol ads are directed not at the greatest number of people, but to those who might resist them the least. How do I know? Because I did the study. I assembled a team of researchers to go out and actually look at all the ads in the Bronx subway system. We linked our observations to data on ridership, neighborhood characteristics, and community health to reveal an alarming reality. I was planning to share the findings of our research on January 19, 2017, at a hearing at City Hall. Unfortunately, that hearing was postponed and has been rescheduled and re-postponed several times since. A new hearing has now been scheduled for September but, frankly, I don’t think this issue can wait. You see, I am a family doctor and see the problems of alcohol use every day. I recognize the damage to hearts, and livers, brains, and bowels. I have witnessed organs fail and cancers arise. I have seen the social and occupational dysfunction. And I have said good-bye to far too many patients prematurely, and watched far too many families grieve an avoidable loss. As a public health researcher, I recognize that advertising matters. Outdoor ads for alcohol are linked to both subsequent intentions to use alcohol and to problem drinking. These facts are particularly true in vulnerable communities and for youth (specifically targeted right here in New York City, right in our public transit system). 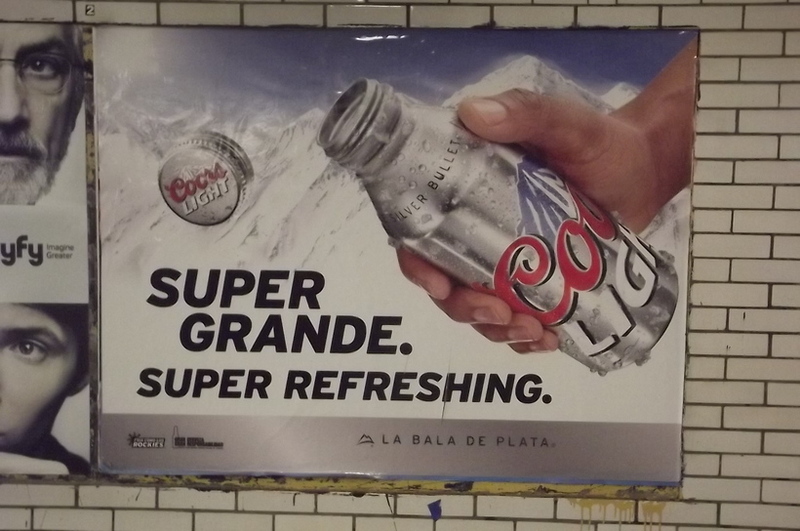 Other major cities have banned alcohol ads in their transit systems. Boston, Philadelphia, Baltimore, Los Angeles, San Francisco, Oakland, San Diego, Sacramento, Seattle, Indianapolis, and Phoenix are among them. Why should unhealthful exposure and indefensible targeting go on any longer in New York City? As I wait to give testimony at the public hearing in September, I have I drafted up a ‘one-pager’ to share with members of New York City’s Council. I also plan to share this document with members of the board of the Metropolitan Transit Authority (MTA). And I’d like to share the document more broadly, here, to help build awareness and momentum for action. An image of the ‘one pager’ appears below. I am happy to provide a copy to any individual or group working in NYC or other affected cities. I hope the message will help persuade those with the power the power to act to do so—to protect our children and our most vulnerable neighbors from suffering further at the hands of interests pushing alcohol consumption. The costs of inaction are too great. I’ve seen too much avoidable suffering. We probably all have.